Mary Ward was born on January 23rd, 1585, in Elizabethan England, at the time of great religious intolerance. She was a victim of the persecution of Catholics and woman of great faith that she was, saw the need for a sound religious education for young women who would assume responsibilities in society and in the church, for, as she said‘women in time to come will do much’. Inspired at the tender age of 15 to renounce the world, she decided to dedicate her life to GOD, having refused many proposals of marriage. 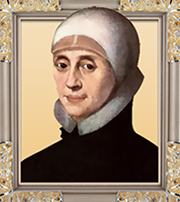 In 1609, she left her homeland and with a small group of companions opened a school at St. Omer Flanders, where girls were taught reading, writing and sewing as well as the principles of Christian life. She had a passionate love for integrity, justice and freedom and she consistently endeavored to live out these qualities. The type of consecrated life which she began – free from enclosure, without religious habit and ruled by a woman – received much opposition.This vision of a woman’s role in the Church was unacceptable and looked upon with suspicion in those days. In 1631, Mary Ward’s Institute was suppressed and she herself was imprisoned as a heretic for some time. Mary Ward, described as “a woman beyond compare”, died at York on January 30th,1645. “Unless the grain of wheat falls into ground and dies, it remains alone” (John:12, 24). The serenity and confidence with which she accepted all kinds of suffering (even physical ones) and her fidelity to the Church despite multiple-tribulations, made of her “the grain of wheat” sown by God and which, after the rebirth of her Institute, would bear fruit world-wide in all the continents, down to the present day.